"David, wearing a linen ephod, danced before the Lord with all his might, while he and the entire house of Israel brought up the ark of the Lord with shouts and the sound of trumpets." Our hunger was satisfied. The dinner plates were cleared. The music segued from light jazz to up beat, jitter bug. It was time to kick off our shoes, let loose and celebrate this happy occasion. But, who would lead us out onto that dance floor? Who would be first? Not wanting to upstage the bride and groom on their special day, I waited patiently, tapping my toes in time to the beat. Behind me I heard the running feet of my 23 month old granddaughter and in an instant she was at the edge of the dance floor, stopped only by the vastness of that great space. 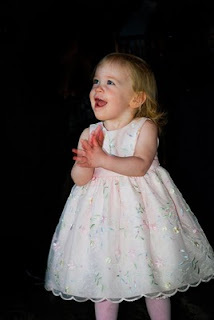 She stood there in her pink foofy dress, with a huge smile on her face, clapping her hands and tapping her feet in her sparkly shoes to the beat of the music. Instinctively she knew it was time to dance and she was ready! Pops took her by the hands and led her out onto the floor. Her joy uncontainable, she squealed with delight, jumped into the air with all her might and with the aid of her Pops. Totally uninhibited by who was watching or what people were thinking she was the first onto the floor. That was it. The party had begun! God calls us to be uninhibited in our worship and our ministry, just like little children. He's placed all the right instincts in our hearts from birth to help us not only survive but to thrive. The catch is He's left it up to us to step onto the dance floor. He'll never push us. He only stands before us with an outstretched hand waiting for us to follow His lead. Once we take hold of Him and start to dance, others will follow and the party will begin! The world is waiting for you to step out. What's holding you back?